According to Michael Corleone in The Godfather Part III , “Never hate your enemies — it affects your judgment.” This is useful marketing advise. You must monitor your competitors to be able to develop effective strategies that achieve your business goals. The hardest part is determining who your competitors are, since it’s not always obvious. As the Godfather, Michael Corleone had it easy relative to today’s marketers when it came to knowing his competitors. While the lynchpin of any competitive assessment is selecting whom to monitor, marketers often use a very restricted competitive set. As a result, their analysis doesn’t provide sufficient insights to accurately guide their strategic marketing planning. Therefore, cast a wide net when developing your list of companies to track. Be alert to the repositioning and departures of existing players, as well as the emergence of new entrants. Here are seven competitors every marketer has and needs to watch to ensure that your marketing is actionable. Direct competitors. These companies sell the same products in the same markets and channels as your company. Don’t exclude a firm due to its size. Similar competitors. These firms sell similar type products and/or ancillary ones in one or more different channels and/or to different audience segments. These competitors may view their market either more broadly or more narrowly. Alternatively, they may sell the same products to a different audience such as businesses or consumers. You can’t overlook them since they could easily cross into your market by leveraging internal efficiencies. Dominant broad-line players in your market. Often this refers to the major diversified merchants such as big-box retailers like Wal-Mart, Costco and/or Home Depot, and/or online merchants such as Amazon and eBay. It’s important to monitor their activity since they’re always looking for new markets and opportunities. Also, depending on your product and distribution channels, assess who else might enter your market. For example, Starbucks, a well-loved brand with lots of retail outlets, could expand what they sell in their stores. They already sell music in the form of CD compilations. Free or rented product alternatives. Customers may opt for free or low-priced alternatives, such as free downloads, the public library or used clothing stores (depending on your product line). In the past, many companies may not have paid much heed to these options. Given the weak economy, don’t underestimate consumers’ ability to make tradeoffs, despite their household income. Warren Buffet lives way below his means. Suppliers. Include your suppliers as well as potential suppliers on this list. They have access to the raw materials that you and your competitors need. Among the factors to look for is whether they’re considering extending their offering to manufactured products, how diversified they are, and whether they supply your competitors. Basically, you’re concerned with their financial viability. Distributors. You need to monitor the companies you sell to since they could extend their product line backwards or they could also deliver your competitors products as well. This could mean that they’re just getting product out of the door and may not care how well and where the end retailer promotes it. New entrants. Include new companies that sell products that compete directly or indirectly with yours. They may be new to the market and may be hiding below the radar in the short run. In particular be aware new players with the power to disrupt and/or change the market such as Apple’s iPad that has changed PC and netbook market or NetFlix that’s disrupted and changed the video rental market. At a top level, every marketer must monitor the activity of these seven categories of competitors to understand what’s happening in their marketplace. By integrating this knowledge into your marketing plans, you can ensure that your strategies are protected and on track. As a result, you won’t need to hate your enemies but, rather, figure out ways to work around them. Therefore, as Michael Corleone advises, your judgment won’t be clouded by your emotions. Have you considered all seven categories of competitors? If so, did it help you to keep your marketing on track? On a related topic, here’s a list of 100 points to keep your marketing on track. Also, here’s another look at how the Godfather’s advice helps social media marketing. 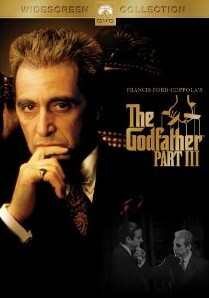 Photo credit: Paramount Pictures; Francis Ford Coppola. Tags actionable marketing, Competitive Assessment, Marketing, Michael Corleone, The Godfather. Bookmark the permalink.